Enjoy the climate inside and outside your home all year long with a high efficiency furnace or central air conditioning rental in Windsor, including Leamington, Lakeshore, Tecumseh, Kingsville, Amherstburg, and more! Windsor is so much more than Canada’s southernmost border city. It is a city alive with art and culture. Residents and tourists alike are able to take advantage of free admission to Windsor Sculpture Park. Located along the Detroit river, this park features 31 large scale sculptures done by internationally recognized artists. Many of the sculptures were even donated by local philanthropists. Not interested in Art? Families have lots of options in Windsor. Make a splash at Adventure Bay Family Water Park featuring 10 water slides, a lazy river and a splash area. Families can enjoy the best Mother Nature has to offer at Colasanti’s Tropical Gardens. With 3.5 acres featuring exotic and tropical plants, this family friendly destination also features kiddie rides, a restaurants and indoor 18 hole mini golf. Enjoying the warmest climate of any Ontario cities, Windsor residents and tourists alike are able to enjoy a warm humid summer and a cold winter. Luckily due to its proximity to the great lakes, Windsor’s winters are warmer and its summers are cooler than they would otherwise be. The lakes do cause humidity in the summer, which some find uncomfortable and severe winters. Luckily, residents in Windsor are able to take advantage of high efficiency furnace and central air conditioning rentals. When it comes to investing in your home, there is no better place to start than you HVAC (Heating, Venting, Air Conditioning) system. Not only can an updated and efficient system help the environment by emitting lower emissions, but it also can translate to huge savings on your energy bills. Upgrading to an energy efficient propane or natural gas furnace with a 96 AFUE (Annual Fuel Utilization Efficiency) from a 15 year old furnace has the potential to save your 45 per cent on your energy bills and 50 per cent on your emissions. In addition to money in your pocket, you also don’t have to worry about upfront costs. We don’t require any down payment to get your rental. From free installation to a free removal of your old unit(s), we save you money and hassles. We can often schedule next day installation with up to 15 feet of venting and duct work. Not only do we save you money, but we carry only the best brands such as Amana and Goodman. We take care of you and we take care of our products. You have coverage when you choose an air conditioner or furnace rental. 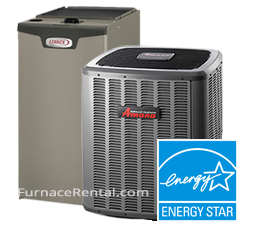 When you choose to rent your heating or cooling system we offer annual maintenance. When you take the worry out of maintenance you are able to ensure that your system will continue to perform as efficiently as possible. An efficient system is a system than is going to keep saving you money on your energy bills. Not only are you going to save money on your energy bills, but you are also going to have additional savings with free service calls. If your heating or cooling systems fail, instead of wasting time calling around for the lowest quote, our clients have access to our 24 hour, seven day a week emergency number. One call gets you expedited service. If for any reason we can’t fix you issue, we will replace your system, absolutely free. So in addition to no down payment, we have a flexible approval process for homowners. As long as you own your property, you are likely to be approved. Rental agreements are not only a great option for home owners, but they are advantageous for business owners and landlords as well. Our low monthly payments can be applied directly to your Enbridge bill and are easily incorporated in your monthly business budget or rent charged to your tenant. If you ever choose to sell your property, the agreement can be easily transferred allowing the new owners to also benefit. So what are you waiting for? All you have to lose are too high energy bills! Give us a call 1-877-525-9081 to start saving right away.